Alex Turner Lic Ac, MBAcC, BSc (Hons), MRSS(T) has been a complementary health practitioner since 1995 initially as a Tai Chi/Qigong instructor. He taught for many years in London and Devon in Adult and Community learning. He then went on to become a shiatsu practitioner and acupuncturist. Alex holds a Bachelor of Science degree in Acupuncture from the University of Kingston where he studied for 3 and half years at the prestigious College of Integrated Chinese Medicine and a diploma from The Devon School of Shiatsu where he also taught for many years. 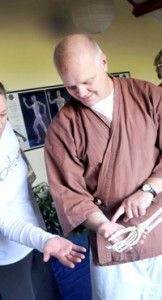 Alex is a registered shiatsu teacher with the Shiatsu Society UK. He was Course Director and tutor at The Devon School of Shiatsu before moving to Bristol. As well has having a busy private practice he worked for many years as a shiatsu practitioner for The Eddystone Trust supporting people affected by HIV. He is now part of The Core Therapy Team at the Penny Brohn Cancer Care Center where he is an acupuncturist and shiatsu practitioner on The Treatment Support Clinic. He also teaches Qi Gung, relaxation techniques and facilitates residential courses on the ‘Whole Person Approach’ to health and well being called Living Well with the Impact of Cancer. If you would like to speak to me personally before booking, I would be more than happy to discuss your case with you on 07748 068360 or email me at daikualex@yahoo.co.uk. Concessionary rates and special rates for a bulk purchase of a series of sessions are available. Please give at least 48hrs notice for a cancellation or regrettably a full cancellation fee maybe charged.